Tube and pipe are ideal materials for fabricating high performance frames and structures because of their high strength to weight ratio. To their detriment, the labor required to conventionally process tube from mill-lengths into weld-ready components is expensive. 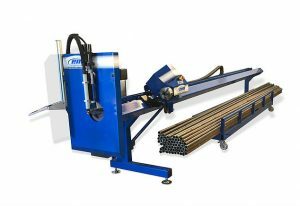 Now fabricators can produce weld-ready components from standard lengths of tubing in one labor saving process. Customers will recognize the immediate benefits of speed and accuracy. 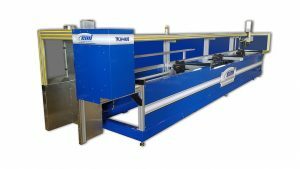 However the revolutionary impact will come as the designers and engineers start to rethink their construction methods and material profiles around the machines productivity. Finished products will benefit from design innovations that were cost prohibitive before. Equipment manufactures will use less parts and provide more features to their customers. Incorporating tab and slot construction methods will reduce layout, fixturing, and welding. One of a kind assemblies will become practical and profitable. The expense and hassels of detailed assembly drawings will be reduced or eliminated when the designs incorporate single path assembly procedures. Some of this sounds complicated but it really isn’t. We have customers who bought this as their first CNC or automated anything and shortly transformed their business, just take a look at our testimonials.